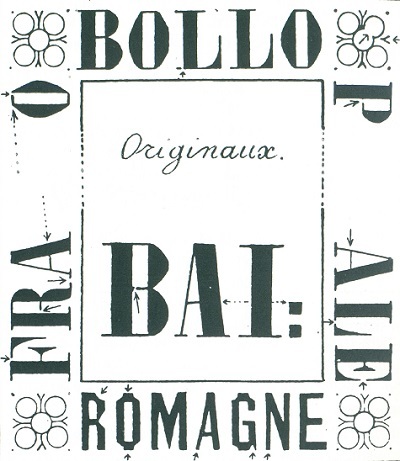 The first and only Italian States stamps for the Provisional Government of Romagna were issued in 1859. Romagna was a former region of the Papal States in North Central Italy, with its capitol at Ravenna. It comprised the present-day Italian provinces of Forli, Ravenna, Ferrara, and Bologna. With the unification of Italy being imminent, a provisional government was established in 1859, and nine postage stamps were issued. These provisional postage stamps were only in use for about five months, before Romagna was annexed by the Kingdom of Sardinia and they were replaced by Sardinian postage stamps. The nine definitive postage stamps shown above were issued by the Provisional Government of Romagna on September 1, 1859. They are typographed on unwatermarked, tinted paper, and they are imperforate. 1/2 B. (1859 - Sc. #1) - Black on Straw. 01 B. (1859 - Sc. #2) - Black on Drab. 02 B. (1859 - Sc. #3) - Black on Buff. 03 B. (1859 - Sc. #4) - Black on Dark Green. 04 B. (1859 - Sc. #5) - Black on Fawn. 05 B. (1859 - Sc. #6) - Black on Gray Violet. 06 B. (1859 - Sc. #7) - Black on Yellow Green. 08 B. (1859 - Sc. #8) - Black on Rose. 20 B. (1859 - Sc. #9) - Black on Gray Green. 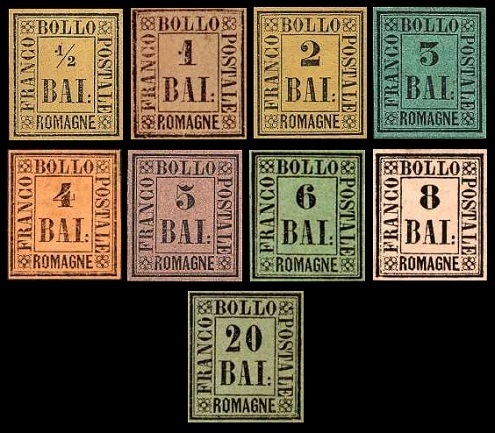 The unused stamps of Romagna, especially if they are without gum, are relatively inexpensive. The used stamps and covers of Romagna are rare and very expensive. Any postmarked stamps or covers of Romagna should be considered suspect, unless they have been authenticated. The illustration shown above, from the Serrane Guide, features the major attributes of the original stamps of Romagna. The Italian States stamps of Romagna were replaced by those of the Kingdom of Sardinia during February 1860. Born in Corsica to a family of Tuscan origin, Leonetto Cipriani (1812-1888) was a French / Italian landowner, businessman, soldier, and politician. His commercial business endeavors, in both Europe and the Americas, eventually made him very wealthy. He took part in both the First Italian War of Independence (1848-1849) and the Second Italian War of Independence (1859). 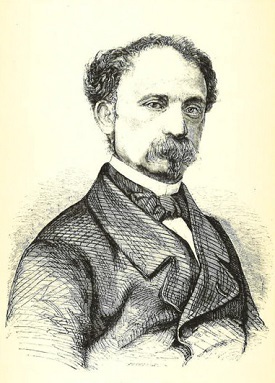 From 1852 to 1855, Cipriani was the Sardinian Consul to San Francisco, and in 1859, King Victor Emmanuel of Sardinia appointed him as the Governor General of Romagna. After 1865, he served in the Senate of the Kingdom of Italy, and in 1882 he retired, spending the rest of his life on his Corsican estate.